Continued from … Off to Turkey! After a good time at Istanbul, it was time to head east – to Kurdistan! I found a flight from Pegasus airlines to Van in eastern Turkey for just under 30 Euro. It was a grim, rainy morning in Istanbul. But 2 hours later, just before landing in Van, the views out of the plane window were magnificent – snow capped mountains, the Van lake in deep blue and just a few puffy white clouds passing by. After landing in Van, I decided to leave my baggage at the Emanat (left luggage), which turned out to be a wrong decision! I went out the the airport and for the first time in this trip, I felt kind of lost. I didn’t really know what I wanted to do. I boarded a dolmuş (mini-van) to the city centre. I gave 5 Turkish Lira to the young conductor, who said something that looked like it was too much. So, I took back 4 Lira, giving him 1 Lira instead, but he was still trying to say something and I had absolutely no clue! Finally, he smiled, gave me a pat and went away. (I later learnt that the fare was 1.5 lira). It was a quiet ride to the city centre at noon. I got down at Kültür Sarayı in the city and met up with Seyit, my local host. 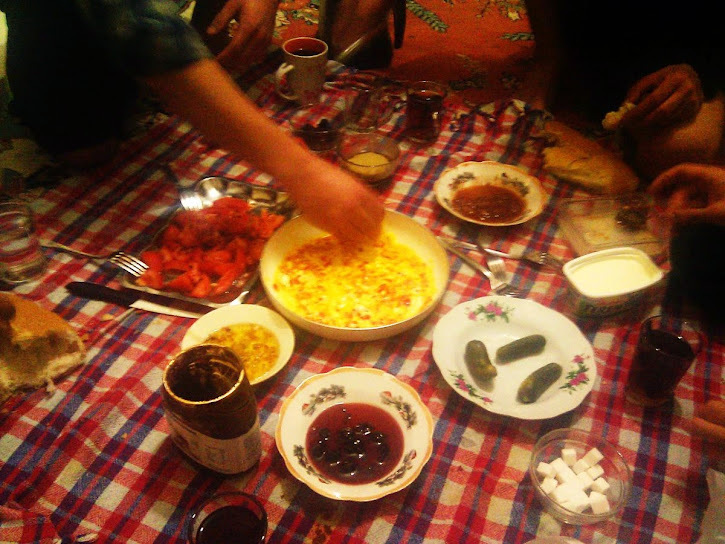 We went to a supermarket and quickly bought ingredients and went home for a great Kurdish breakfast – shared with all his five flatmates in the traditional style! It was already about 1 pm by now. And the airport apparently closed at 5pm. I had to go back and get my luggage. But this time, I did it in style, like a local – I knew the exact fare, and also knew where to get on and get out! I felt I was deep enough in Asia that it actually felt like home – the chaotic traffic, people everywhere, crowded buses, horns etc. and I was loving it! After I was back from the airport, Seyit took me to a local Kurdish restaurant, where I had some delicious roasted vegetables with many accompaniments. I must confess that I enjoyed the accompaniments more than the main course! The restaurant manager who joined us for a chat, was quite surprised and felt pity for me that I didn’t eat meat! Refreshing jars of Ayran after a great dinner! After gulping down the huge jar of Ayran, Seyit told me that there is a great cafe that one must really visit in Van. We walked through narrow alleys and finally found the cafe on a dimly-lit terrace. He said that the cafe was entirely made by hand using recycled old items by someone very ‘pro-Kurdish’. The cafe was called Eskigi (I might be spelling it wrong, I heard it as ‘es-key-jee’), meaning second-had tradesman. The ambiance was great and felt really local. We spent a lot of time discussing travel plans, couchsurfing friends (Seyit told me about an Indian couchsurfer who had learnt and spoke very good Turkish! ), Kurdistan and in general, everything under the sky. I had my postcards written, stamped and ready to be posted. But to my surprise, Seyit told me that there are no post boxes! One has to go to the post office to post them! So, he offered to post them the next day. But in our hurry to catch the dolmuş, I forgot to give him the postcards! When the Dolmus dropped me off at Van station, it was a bit eerie, because I had expected the railway station to be a place with some hustle-bustle. But it was in the middle of nowhere, dark and deserted. For the first time in this trip, I felt a bit scared as the dolmuş whirred away and left me alone at this empty place. The time was half past nine, I went inside and found a small waiting room with about twenty people. I found one western-looking guy with a ‘Columbia’ jacket. English and German brought us together as I learnt that he was Swiss-german with a long travel history! After the train was already late by about half an hour, we tried to ask when was the train likely to reach. People smiled and said, “Just go and have a nap, we’ll wake you up when it arrives”. This entry was posted in Asia, Turkey and tagged cafe, couchsurfing, dinner, lake, turkey. Bookmark the permalink.